Ed Sheeran played a secret show earlier today (May 5th) in Ipswich, UK to a crowd of only 50 people. The short acoustic set took place at the Steamboat Tavern, a venue where Ed had played in the past before his rise to fame. Prior to the show, the "Lego House" singer signed autographs and took pictures with fans who were waiting in line. A fan-shot video from the show can be viewed below. 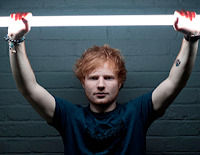 The show was part of a one day tour that took place in Ipswich, London and Dublin to support Ed's long-awaited new album X that drops June 23rd.